Mr Erik Himmel of Schriever, Louisiana has kindly sent me a pile of information about his great-great-grandfather, the late Captain Victor Joseph St. Martin, for use in a biographical sketch on Antietam on the Web. Captain St. Martin was wounded and captured in action at Sharpsburg while commanding Company K of the 8th Louisiana Volunteer Infantry. St. Martin returned to his Regiment, but was later killed on Cemetery Ridge at Gettysburg. The son of a veteran of Napoleon’s Army and physician, Victor was raised in and near Donaldsonville, Louisiana where Bayou Lafourche splits from the Mississippi. He married at age 19 in 1847, and by 1861 had six children (a seventh was born during the War). In May of that year he joined the Phoenix Company which mustered into service in June as Company K of the 8th Infantry. St. Martin was First Lieutenant. 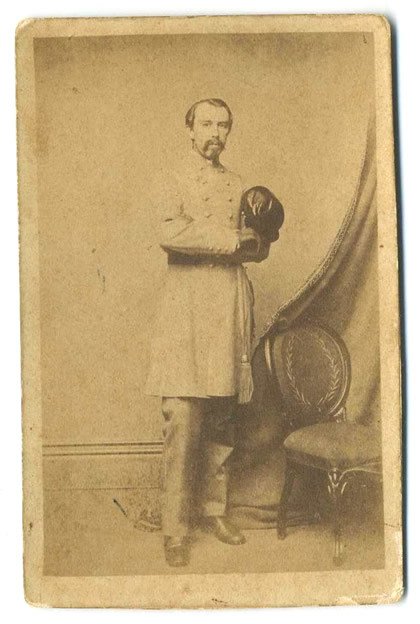 He was on recruiting duty for the Regiment back home in February and March 1862, then in combat with them under “Stonewall” Jackson on the Shenandoah Valley Campaign (May-June 1862), in the Seven Days (June), at Cedar Mountain and Second Manassas (August), and into Maryland. He had been promoted to Captain and command of the Company on the death of Captain Lawrence D. Nicholls in June 1862. The 8th Louisiana was at Harpers Ferry and fought with the rest of Hays’ Brigade in the Cornfield at Antietam early in the morning of 17 September 1862. Among the thousands of casualties in that terribly bloody space was Captain St. Martin, wounded “severely”. 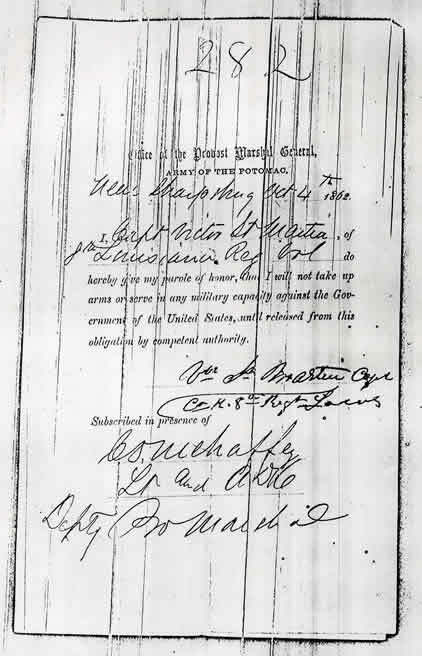 He was captured by Federal troops, but paroled on 4 October, and exchanged for a Federal officer to return to duty on 5 November. The regiment was at Frederickburg (December) and Chancellorsville (May 1863) before heading for Gettysburg, where Captain St. Martin was killed on 2 July 1863. 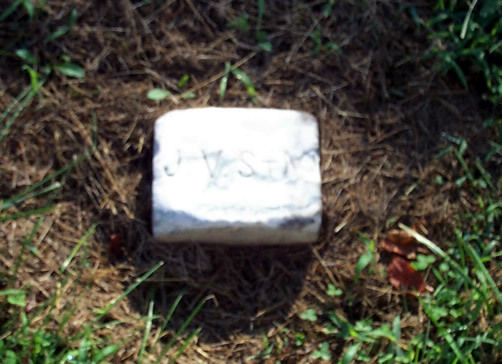 He was likely buried on or near the battlefield there, but, just over a year later, removed and buried in Green Mount Cemetery, Baltimore, Maryland by friends of the family. The Captain’s youngest child Ida (later Mrs Dossat) is Mr Himmel’s great-grandmother, and she lived well into his lifetime, so this is probably not distant history for him. Judging by the following clipping (c. 1959-63), it’s not so far removed for his other family and neighbors, either. 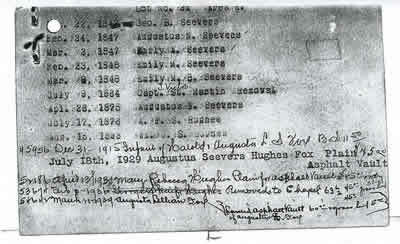 Thanks to Mr. Himmel for the scans of the items you see here, and for bringing his GGGrandfather to my attention. I hope we’ll do him some justice on Antietam on the Web. Thanks also to Mr. Wayne Cosby, historian of the reenacted 8th Louisiana, Company B, who has posted regimental rosters and other data, as well as a brief biography of the Captain online. And to Mr Michael Williams, past Commander of the Harry W. Gilmor Camp, Sons of Confederate Veterans (SCV), Baltimore, who, on Mr Himmel’s behalf, did the sleuthing and legwork to find the final resting place of Victor St. Martin, unknown to his descendents until this year. The uniform sash mentioned in the news clipping is on display at Confederate Memorial Hall on Camp Street in New Orleans. Capt Victor Joseph St Martin is my great, great grandfather. I have the large enhanced portrait that was made from the original photo in my home in Jacksonville, Fl. I inherited it from my father, Ernst Jacob Leidner, Jr. He inherited from his mother, the former Heloise St. Martiin of Pensacola, Florida. She inherited from a relative in New Orleans. I feel very fortunate to have this portait in my home. I treasure it. Captain Victor St Martin was from Donaldsonville, Louisiana. I don’t know of any relatives with the same name that live up north. VJ St Martin was actually killed during the battle for Cemetary Hill on 2 July 1863 between 8:00 and 9:00 PM. The 8th LA was never in the vicinity of Cemetary Ridge, which is part of the site where Pickett’s charge occurred. If you want to be completely correct, the battle called Cemetary Hill was actually fought on East Cemetary Hill, although it is usually just referred to as Cemetary Hill. VJ St Martin was my great great grandfather. It was one of the most intense battles of the war but sadly came to nothing as the supporting division on the right of Hays Brigade never launched their supporting attack – thus all was for naught.